Today, I'm heading out to Delphi to see the ancient site of the Oracle. OK, it's not exactly Athens, more than 3 hours out in fact. The ancient Greek world considered Delphi a sacred site, an important a site of worship of Apollo. 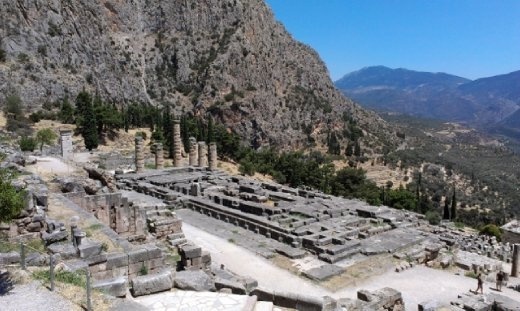 Delphi is also the location of the Delphic Oracle, the most important one of it's kind in ancient Greece. In Greek mythology, Zeus sent two eagles to fly across the world in opposite directions. The point at which they met in Delphi was the centre of the world. A place marked by the Omphalos stone, and defended by the dragon Python. Conflicting accounts from Greek myths blur the origins of the site. Apollo is the god of prophecy and one myth has it that he slew the Python here. Reason enough for this site to be dedicated to him. Nowadays, Delphi is UNESCO World Heritage Site. There are many daily buses from Athens, all taking about 3 hours from Terminal B Bus Station. The bus drops me off at the modern village of the same name at about 1230, just outside the In Delphi restaurant. The restaurant manager helpfully points me in the right direction before I even opened my mouth to ask. It's only 10 minutes walk to the archaeological site and the adjacent museum. At the museum is where I realised my first mistake. The museum closes at 4, every day now. Another victim of ongoing crisis in Greece. With only 3 hours, I elect to forgo the museum ticket so that I can see the Delphi site, plus the Sanctuary of Athena. It's 3 pm when I walk back to the museum area. In theory I could have had an hour before closing time, but by now I was too tired from all the walking to be interested in another hour of walking in the museum. The earlier closing time of the museum brings me to a second mistake. I'd pre-booked (necessarily) a ticket for the 6 ish bus back to Athens not knowing about the museum times. When the 4 ish bus back to Athens does arrive, it's packed and I can't get on. With 2 hours to kill, I have a wander around the village. The "walkable" areas is tiny and takes all of 20 minutes. The day ends when I finally get back to my hotel a 10 in evening.